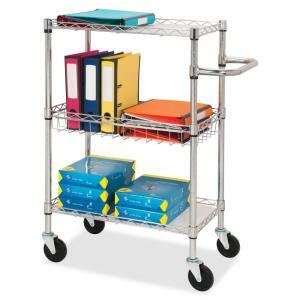 3-Tier Rolling Cart features three levels to hold plenty of office supplies or refreshments. Convenient handle on the side allows easy maneuvering. Top basket can accommodate letter-size and legal-size hanging folders. Sturdy bottom shelf is designed for larger packages and bulk goods. Heavy-duty steel tubing and wire withstand constant use.